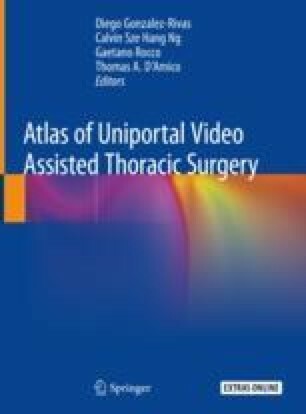 Uniportal video-assisted thoracoscopic surgery (VATS) is an emerging technique, which can be laid into the spectrum of great efforts achieved in minimally invasive thoracic surgery. Although technical difficulties due to limited access and angulation do exist, great progress has been achieved during the past decade. Uniportal VATS is now widely used to perform different lobectomies, among which left upper lobectomy may be the most technique demanding one. This chapter aims to illustrate methods and techniques for uniportal VATS left upper lobectomy by single direction approach. The online version of this chapter ( https://doi.org/10.1007/978-981-13-2604-2_22) contains supplementary material, which is available to authorized users.